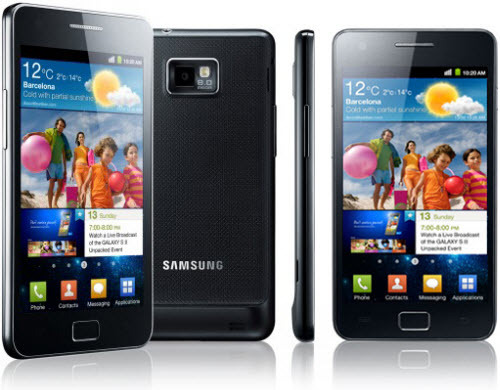 Samsung Galaxy S 2 Review – Light Enough! The S 2 is so light, You won’t feel the S 2 weighing you down once it’s ensconced in your pockets or handbag While the Galaxy S2 will certainly fit into the tightest jeans pocket, the compromise is build quality – the body just feels cheap and uninspiring. Things don’t improve when you remove the wafer thin back to insert a sim – we’d be seriously worried about snapping it. Controls are limited to volume on one side, power on the other, MHL port, which serves a dual purpose of charging via USB and outputting to HDMI, and a 3.5mm jack on the top, Samsung includes a range of streaming options including DLNA. Display: 4.3 inches is not considered to be a big screen nowadays. The S 2’s display doesn’t have the highest of resolutions — 480×800-pixel panel, so it’s not as pin-sharp as the iPhone 4’s 640×960-pixel screen (if we have to compare it with iphone 4, also can be compared with the recent hot HTC android phones, too). But this screen isn’t blurry at all — text looks very clear, and we didn’t spot any irritating fuzziness around icons. The S 2 uses Super AMOLED Plus display tech, which, despite being a meaningless string of letters, actually makes for a really impressive screen. In direct sunlight, making out on-screen action is tricky, but this is true of every smart phone, tablet and laptop. The S 2’s brightness means it’s easier to see in sunny conditions than many rival phones, but this isn’t the mobile to finally free us from the sun’s oppressive glare. As an added bonus, the S 2’s display floats spookily close to the top of the glass front of the phone, which lends it an extremely classy veneer. It’s something we also appreciated on the oozing-with-class Sony Ericsson Xperia Arc. The viewing angle is very wide, so you’ll be able to appreciate every colour and hue even if you’re not looking at the screen dead-on. How to rip Blu-ray movies to Samsung Galaxy S2 Easily?How to convert DVD movies to Samsung Galaxy S2 with high output quality?Check here and you will find out the answer. Running Android 2.3.3 (Gingerbread), you get seven home screens customisable with widgets and shortcuts. Swipe down to quickly activate WiFi, Bluetooth, GPS and Auto Rotation settings. Phone, Contact, Messaging and Application settings along the bottom are static when you are browsing the home screens. Like other Android phones, press down to customized with Shortcuts, Folders, Wallpaper and numerous Samsung widgets. The iconography is still somewhat cartoonish, and we still can’t figure why Samsung decided to make the left-most home screen pane the default. Samsung’s widgets – for news, weather, calendar, bookmarks, various clocks, social networking and a task manager, among others – are also more colorful than, say, those HTC uses in Sense, but there’s a good range on offer and we prefer Samsung’s system for choosing from them. Something we wish Samsung had left well alone was the standard Gingerbread keyboard. The replacement is frustrating in various minor ways: we had problems with it recognizing faster text-entry, particularly missing space bar taps, while the auto-prediction and auto-correction aren’t as accurate as Android’s native system. Auto-capitalization is inconsistent – sometimes “i” doesn’t get automatically changed to “I” – as is apostrophe entry, so you end up with “im” rather than “I’m” most of the time. Swype is preinstalled, though not the default, and of course there are multiple alternative keyboards to choose from in the Android Market, so it’s certainly not a deal breaker. Samsung’s other main change is under the “Motion” heading in the settings page, using the Galaxy S II’s accelerometer to control various functionality. You can have the phone mute incoming calls and sounds by turning it face down, or zoom in and out of webpages or images by touching two fingers to the screen and tilting the whole thing back or forward. We had mixed results with the latter, with our movements sometimes not being recognized. It’s also very linear: you can’t angle the phone as you tilt it, to shift the portion of the screen which you zoom in on. Check a powerful ripping software for both blu-ray or DVD movies ! Camera and multimedia: With its Super AMOLED Plus display and high-resolution cameras, the Galaxy S II obviously has plenty of multimedia potential. The main camera, at 8-megapixels, is a welcome step up from the 5-megapixel example in the original Galaxy S; the front-facing camera is, at 2-megapixels, at the top end for what we’ve seen studding the bezels of recent smartphones. In contrast, the iPhone 4 and HTC’s recent line-up offer mere VGA resolution. Still, it’s good enough for voice calling and the occasional vanity snap, but not really anything more thanks to the fixed-focus lens.